More than 300 competitors took part in Mikołów Street Run held on September 27th. They had to run 10 km distance. Wojciech Czernek proved to be the best among men and Mariola Sojda, who beat women’s record at that distance, proved to be the best female runner. 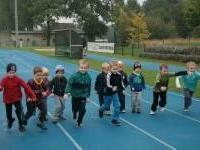 There was also a run for children and youth, held before the main run, with more than 80 runners participating. The results are available at www.mosir.mikolow.eu.